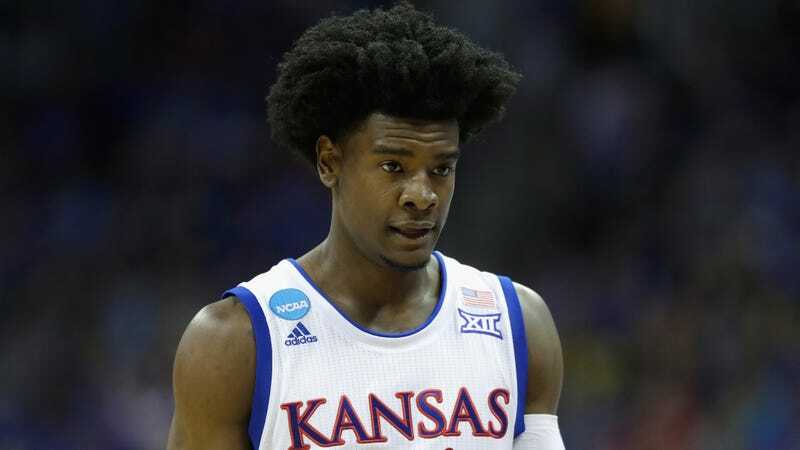 The Kansas City Star has the details on former Kansas basketball player and future NBA lottery pick Josh Jackson’s court-mandated diversion agreement, which stipulates that Jackson has to, among other tasks, attend anger management, abstain from drugs and drinking for a year, and write letter of apology to Kansas women’s basketball player McKenzie Calvert. Jackson was charged with a misdemeanor count of criminal property damage for a December incident in which he purposefully damaged Calvert’s car during an altercation outside of a Lawrence bar. He pleaded not guilty on April 12, announcing his plans to seek diversion to keep his record clean. His lawyer previously failed to pay off Calvert’s father in early February in an attempt to avoid charges altogether; the Calvert’s declined the payoff, opting to move forward with the case. “(O)btain a substance abuse evaluation” by June 30 and “complete all the treatment recommendations listed in the evaluation.” If no recommendations were made, Jackson was “required to complete Alcohol Information School” by Oct. 31. Outside of the bar, Jackson proceeded to verbally harass her before re-entering the bar. He then exited the bar with Vick and a group, following Calvert to her car where he broke her car’s taillight and dented her driver-side door as she attempted to leave. The vehicle suffered $3,150.45 in damages, including cracks in the windshield, but police could not prove that Jackson was solely responsible, helping him avoid the felony charge that kicks in when $1,000 worth of damage has been done. Neither Vick or Jackson received any internal punishment from head coach Bill Self, at least none that has been made public—Self even sat in on Jackson’s interview with police. Calvert, meanwhile, was banned from using the Allen Fieldhouse facilities and was briefly suspended for the team’s next game by women’s head coach Brandon Schneider. If Jackson, a projected top-5 pick in the upcoming NBA draft, violates any portion of his diversion agreement, he will have to pay Calvert the full $3,150.45 in damages.